Sponsorship works well when the big creative idea connects with the audience emotionally and it develops relationships with customers. 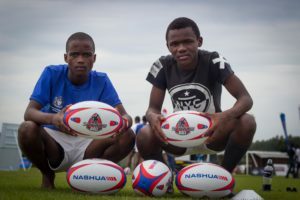 At the end of 2016, an inspired collaboration between Brand inc and ShadowBall led to the Nashua Rugby Skills Project (NRSP) being born. It’s a sponsorship that ticks all the right boxes, developing both South African rugby and human beings through sport. NRSP is innovative, proudly South African, incorporates a CSI element and has a very strong business strategy behind it. Enter ShadowBall, an amazing revelation in rugby skills training. This unique rugby training ball is designed to rebound off any wall and come spiralling right back to the passer. For the first time ever, ShadowBall enables rugby players to train solo passing and catching. 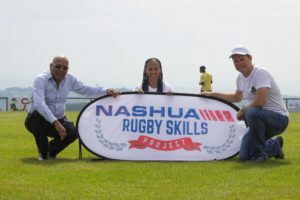 And in partnership, the Nashua Rugby Skills Project was born. Endorsed by the Centre for Human Performance Sciences at Stellenbosch University, Golden Lions, Deaf Bok Team as well as several of the Top 100 Schools, ShadowBall has been scientifically proven to increase passing accuracy by as much as 266% in just four weeks. The NRSP began its roll-out on 30th January and brings the ShadowBall Academy to approximately 2,500 Grade 8 pupils at 72 schools, with half of these schools being from developing areas. On the day, Nashua staff from the local franchise get involved, and coaches and players are trained. To add to the excitement, each event is attended by one of four ex-Springboks, Gcobani Bobo, Dean Hall, Sino Ganto or Morgan Newman. 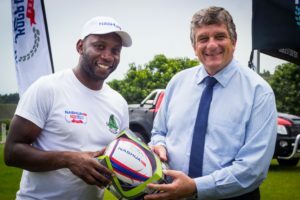 NRSP ambassador and former Springbok Rugby player, Gcobani Bobo, with the Principal of Grace College, Vincent Luksich. 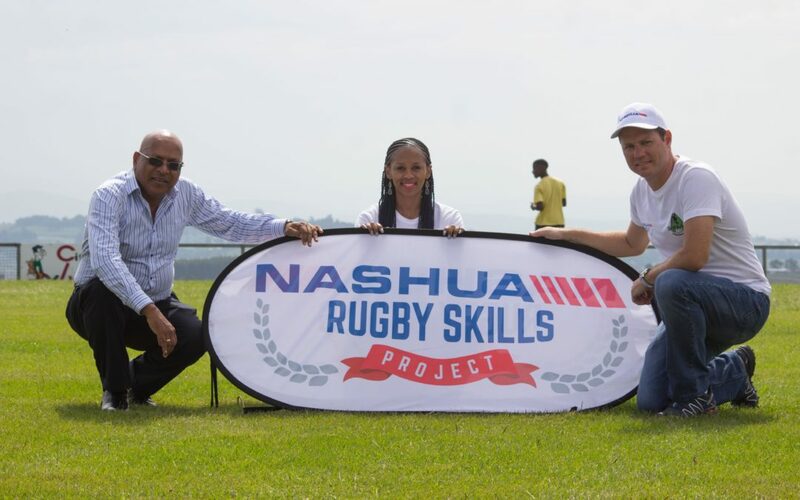 Nashua has always been involved in rugby support at school level and its recent sponsorship of the Currie Cup highlights the brands level of commitment to all tiers of the game. After the first round of training, the project leaves every school with 22 Nashua-branded ShadowBalls, a coach’s manual and a set of Google cardboards with instructional footage for the coaches and kids. Schools and players are further incentivised with prizes for the most improved. NRSP revisits the school for round two after six weeks and the same tests are performed to collect improvement data. Previous assessments at numerous Jo’burg-based schools have shown an average team performance increase of 20% in a mere four weeks. Nashua Martizburg franchise owner Nad Naidoo (left) says the NRSP is a very good initiative with a strong development point of view. From the business perspective, the partnership has allowed the brand to make in-roads with a crucial target market. The local Nashua franchise gives the participating schools a comprehensive, free office assessment to evaluate where and how they can save time and money, and the investment is already paying off. Nashua Kopano’s Head of Solution Sales, Navesh Naidoo attended the NRSP roll-out at PLG School in Johannesburg with Nooitgedacht scholars also in attendance. “It’s a very good initiative with a strong development point of view, and it was great to see the kids having so much fun and improving their rugby skills,” he says. “It has really helped us to build a relationship with the schools and after the office assessment, identify ways that they can minimise costs and boost productivity. 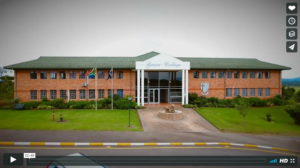 It has already opened various business opportunities for us,” Naidoo adds.